Consuming organic and biodynamic wines supports sustainability by avoiding the use of fertilizers, pesticides, fungicides and herbicides. In order for a wine to bear the USDA certified organic label, it must be grown from organically grown grapes without the use of added sulfites. Certified organic wine can contain no more than 20 ppm of naturally occurring sulfites. Wines with any of these labels must have at least 70 percent organic ingredients, with the remaining 30 percent of ingredients either an agricultural ingredient that is not grown organically or another substance like added yeast. These wines may contain added sulfites, but the total must still be under 100 parts per million. They also may contain yeasts, bentonite or egg white gases (e.g., N2, CO2) from the winemaking process. Biodynamic Wines go beyond organic by treating the farm or vineyard as a self-sustaining ecosystem, encouraging extensive root systems and active soil life through methods such as cultivating the soil and planting cover crops, using natural fertilizers, homeopathic sprays, herbal preparations, lunar cycles, promoting a biodiversity of plants and encouraging natural predators of insect pests. Biodynamic principles do allow for the use of sulfites though. Biodynamic wines are certified by Demeter USA, a globally recognized certifying organization which uses strict guidelines. In order to be certified, a winery must first be certified organic (a three year process), then undergo 24 months using strict Biodynamic practices (as overseen by Demeter). 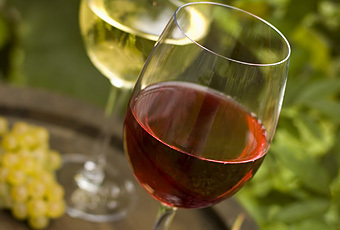 Winemakers, both organic and conventional, are not obliged to declare on the label when they use animal by-products as fining agents to clarify wine. These include egg white (to brighten red wines), casein (a milk protein to make wine taste softer), gelatin (removes bitterness) and isinglass (derived from fish). A vegan wine, on the other hand, uses no animal products whatsoever thus reducing the toll taken on land, water, and energy usage. There isn’t a certification available for sustainably produced wine, so you will just need to read the label. Since most US wine comes from California, check The California Winegrowing Alliance who lists sustainable wineries found in California. According to a study posted on drvino.com, organic wine definitely has a lower green house gas intensity, but it is not a huge leap from conventional to organic (not taking into consideration the local ecosystem). The bigger hit is taken on the transportation of the wine or the food miles. There is a “green line” that runs through the center of Ohio. To the west of that line, it is more carbon efficient to consume wine trucked in from California (90% of American wine comes from California). For the easties, it’s better to consume wine that has been imported benefiting from the efficiencies of container shipping and decreased truck time. All of these different labels can be confusing, so for those interested in wines which are kind to the environment, look for wines that are made from organically grown grapes or the biodynamic label. For those interested in additional health benefits, look for the certified organic label. Salute! If you are having a hard time finding wine locally, check out our list of online organic and biodynamic wineries. © 2008 GreenPromise.com All rights reserved. Help save the planet by spreading the news about natural and organic products and how to live an organic and green lifestyle. For reprint permission, contact the Green Promise editorial staff at reprints@greenpromise.com.